Friedrich Wilhelm Raiffeisen was born on 30 March 1818 at Hamm/Sieg (Westerwald). He was the seventh out of nine children. His father Gottfried Friedrich Raiffeisen was a farmer and also mayor of Hamm for a while. One can go back to his family’s origin until the 16th century in the Swabian-Franconian area. The family of his mother, Amalie Christiane Susanna Maria, born Lantzendörffer, came from the “Siegerland”. Leaving school at the age of 14 he received three years of education from a local pastor before he entered the military at the age of 17. His career in the military led him to Cologne, Coblenz and Sayn. An eye disease forced him to resign from the military service in 1843 and he went into public service. 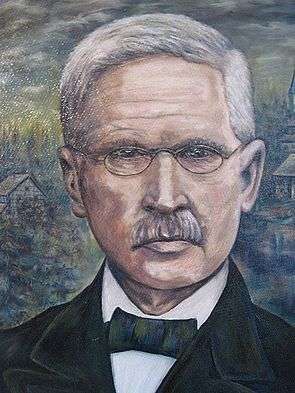 He was mayor of several towns: from 1845 he was mayor of Weyerbusch/Westerwald; from 1848 he was mayor of Flammersfeld/Westerwald; and finally he was mayor of Heddesdorf from 1852 until late 1865, when, at the age of 47, his worsening health cut his career short; he had caught typhus in 1863 during an epidemic during which his wife had died. Since his small pension was not sufficient to meet the living of Raiffeisen’s family he initially started a small cigar factory and later on a wine business. In 1867, he married the widow Maria Panseroth. She outlived him by 12 years and their marriage remained childless. He died on 11 March 1888 in Neuwied-Heddesdorf, shortly before his 70th birthday. 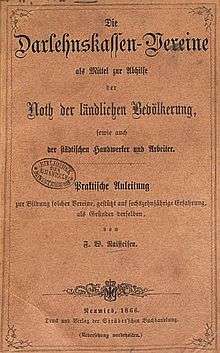 The cover of "Raiffeisen-Ratgeber: Die Darlehnskassen-Vereine" 1866 by Friedrich Wilhelm Raiffeisen. In it Raiffeisen sets out how to establish credit unions and other co-operatives. Motivated by the misery of the poor part of the population he founded during the starvation winter of 1846/47 the “Verein für Selbstbeschaffung von Brod und Früchten” (Association for Self-procurement of Bread and Fruits). He had flour bought with the help of private donations. Bread was baked in a self-built bakery and distributed on credit to the poorest amongst the population. The bread society as well as the aid society founded in 1849 in Flammersfeld and the benevolent society created in 1854 in Heddesdorf were pre-cooperative societies based on the principle of benevolent assistance. In order to secure the liquidity equalization between the small credit banks, in 1872 Raiffeisen created the first rural central bank at Neuwied, the “Rheinische Landwirtschaftliche Genossenschaftsbank” (Rhenish Agricultural Cooperative Bank). In 1881, Raiffeisen created a printing house in Neuwied which still exists today, carries his name and was merged in 1975 with the German cooperative publishing house “Deutscher Genossenschafts-Verlag”. Raiffeisen stated that there is a connection between poverty and dependency. In order to fight poverty one should fight dependency first. Based on this idea he came up with the three 'S' formula: self-help, self-governance and self-responsibility. Originally in German: Selbsthilfe, Selbstverwaltung and Selbstverantwortung. When put into practice the necessary independence from charity, politics and loansharks could be established. The Kosovo subsidiary of RZB sponsors the Raiffeisen Superliga, a soccer league in Kosovo. 1 2 3 "Internationale Raiffeisen-Union" .Accessed: 18-04-2011. ↑ Friedrich Wilhelm Raiffeisen 1818-1888, Deutscher Raiffeisenverband (in German), undated.Accessed: 06-15-2008. ↑ Raiffeisen, Friedrich Wilhelm (author); Engelmann, Konrad (translator) (1970) . The credit unions (Die Darlehnskassen-Vereine). Neuwied on the Rhine, Germany: The Raiffeisen Printing & Publishing Company. OCLC 223123405. ↑ Raiffeisen levensroman van een groot pionier, Rabobank Nederland Coöperatie & Bestuur AB, 2005.
International Raiffeisen Union, dedicated to promoting the life, work and ideals of Herr Raiffeisen and his cooperative movement's ideals. "Raiffeisen, Friedrich Wilhelm". Encyclopedia Americana. 1920.